This book is not about your mother’s fairies. Nor is it about Disney’s pixies, although Tinkerbell (as she’s portrayed in the original film, Peter Pan, if not in the many spin-off films for young girls) is closer to the folkloric portrayal of faeries than one might think: imperious, easily offended, and mercurial. 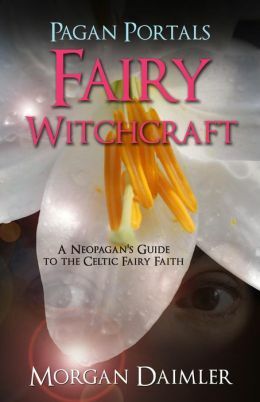 The fluffy, sugar-and-spice, white-light versions of the Fae that are so popular with children are nowhere in evident in this book, the author’s introductory work on Fairy Witchcraft. Morgan Daimler, the book’s author, here describes her own path, a Celtic traditionalist form of fairy witchcraft based on experience, history, and her own reading. Although fairy witchcraft might take on different forms depending on the reader’s view of the Fair Folk, the book goes into great detail discussing such things as basic beliefs, tools, holidays, plants and animals, and contact with the Otherworld. Emphasis is placed throughout the book on courtesy, patience, protocol, and as much understanding of the Others as possible. Just as the gods are, the Gentry are creatures beyond human levels of power, with appropriate means of displaying their displeasure when they are insulted. Daimler’s experience with the Kindly Ones shows here in every page; from anecdotes related with a wry humor to specific cautions on nonhuman etiquette, her words draw the reader in and invite them to learn and try things outside their usual pace. One of the things the book goes into depth about is the unpredictability of the fairies; the way they react to things is almost certainly never the way a human being would react, and woe to the person who confuses the two. Daimler’s tone here is calm, confident, and engaging, whether she is discussing healing a broken section of the land, getting lost in the woods (being pixie-led), walking through a veritable storm of pink flower petals, or dealing with the all-too-notorious tendency of some fae to “borrow” items and return them later (in places far from where they first went missing). Her interest in and affection for the topic shine through with every sentence, and so do her years of experience in interacting with the Fair Folk. The last chapter of the book deals with magic, and there are a number of spells and a self-dedication ritual (located in the first appendix) for those who wish to get their feet wet right away. Nor does the author’s work rely on personal experience alone. At the end of the book is a substantial bibliography for readers who wish to dig more deeply into older sources, as well as an appendix listing movies, websites, and even fiction dealing with the Other Crowd. For those readers who have always felt the pull of the lands of Faerie and that land’s mysterious, elusive inhabitants, Daimler’s book is an excellent introduction toward learning more and meeting those inhabitants themselves. I can recommend it without hesitation as a book that easily deserves a place of pride in every pagan’s library.